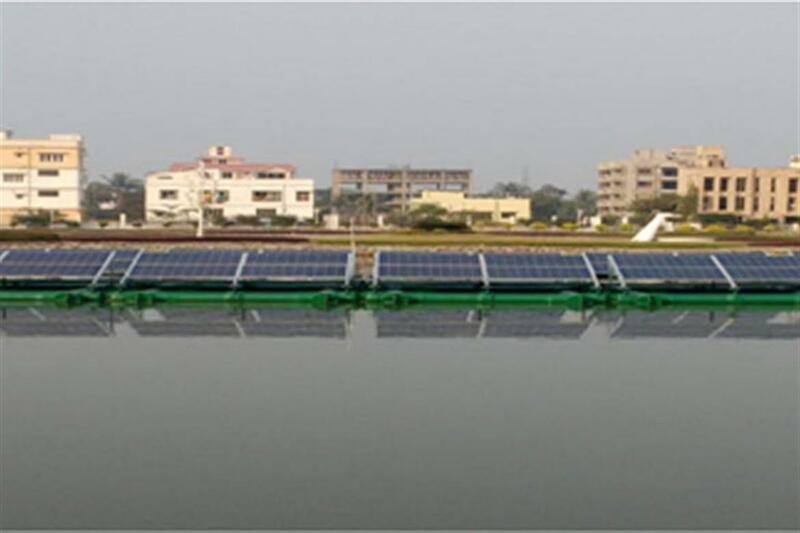 In 2014 India’s first pilot Floating Solar Power Plant of 10 kWp capacity was set up at New Town, West Bengal. The performance of the plant has been found to be excellent. a. 40 nos. PV Panels @ 250 Watt per Unit to generate 10,000 Watts. b. Structures to support PV Panels. c. Walkways and their supporting structures. e. A Floating Platform to carry all the above. f. Anchoring arrangement for keeping the Platform in place. Surrounding temperature is low in summer ensuring higher generation of power from PV modules. Dust accumulation is much less when the modules are installed on water bodies. Conservation of water due to less evaporation. Algae formation in the water body will be less due to continuous maintenance of the Solar Floating System. · Stability of the platform is important. It must be anchored from all four sides and the distribution of loads needs to be fairly uniform. Proper anchoring is also required to ensure the panels do not move with rain and / or high-speed winds as any change in the direction or orientation of the PV panels will affect power output. · In grid connected inverter, frequency control is necessary, If the grid frequency exceeds the tolerance band, the project goes into islanding mode for protection, but this results in energy losses. · Possible negative impact on aquatic life (flora and fauna) needs to be monitored.